BELIZE CITY, Mon. June 1, 2015–The principal of Nazarene High School, Elisa Seguro, has confirmed to Amandala that a group of first form students are being suspended for taking up what has been dubbed, “the Charlie, Charlie Challenge,” in school last Thursday, amid what has proven to be a mysterious global wave over social media to promote an activity which purportedly summons up “a Mexican demon” using what has been described as a rudimentary form of the Ouija board. We know that the so-called game, which challenges players to call up “Charlie,” asking if they can play with the demon or not, has been introduced among students in several schools at both the primary and secondary school levels, and spiritual leaders have been called in to speak with and pray for students. 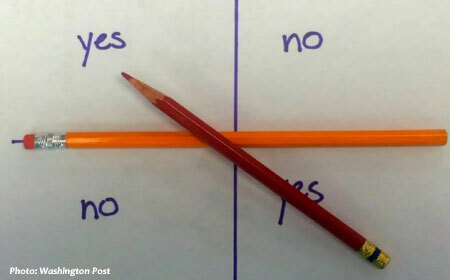 The pencils, which are balanced on top of each other over a cross with quadrants that have “yes” and “no” options written alternately in each quadrant, should rotate to a particular answer when the player asks “Charlie” a question, such as what will happen in the future. Some online reports say that scientists explained the phenomenon of the pencil moving using the physics of gravity. However, there are also multiple reports of paranormal experiences by some who have played “Charlie, Charlie,” which religious leaders attribute to demonic forces. In the case of Nazarene High School, Pastor Japheth Pat was called in Thursday afternoon after a teacher found her class in hysteria over the playing of the game during a changeover from a previous class to hers. She told her students to get settled, but they refused, so the teacher went to the principal, who then got the pastor to speak with the first form class in question about meddling in the occult. The principal told us that the students did not display paranormal behavior, but she told us that while the pastor was moving through the rows of students and praying, she felt two “waves” move over her, which she presumed to be the demonic spirit. The teacher who reported the incident was standing behind her and appeared to be terrified by what appeared to be an evil spirit, we were told. The Nazarene students who introduced the game into the classroom will face a work suspension after exams conclude next week. Caribbean 360 news, meanwhile, reported that spiritual leaders within the region have warned youth against participating in the game, saying that “…it is demonic.” Education officials in both Jamaica and Antigua have reportedly banned it from schools. Chief Education Officer Chris Aird told Amandala that he had not heard any reports of Charlie Charlie being used in Belize schools and nobody has reported it to him, but he did undertake to look into the matter. We have been informed of at least one other Belize City school where students could face disciplinary action for introducing the game at their school.